Our classy and functional Keep Portland Weird key chains have done it over and over again! Keep track of your important keys while telling the world you adore Portland for having an independent economy. Put your most important keys onto this ring and you'll never be the same. 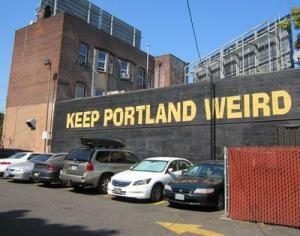 Jiggle those keys proudly while you tell the world TO 'KEEP PORTLAND WEIRD! Only $3.00 each! Stick one of these Keep Portland Weird magnets on your refrigerator, locker or any other metal surface you can think of! You can even use it as a paper weight, bookmark, or for cleaning the pepper out of your teeth that you don't see right now. Whatever you choose to use it for, or stick it on, it will show your friends that you ARE "KEEPING PORTLAND WEIRD!" Only $4.00 each! Invite your best pal over to your snazzy indoor bar, fill one of these with the spirit of your choice, and toast one to your local distilleries! Give it a SHOT! Only $3.50 each! Whip out a set of these awesome Keep Portland Weird pint glasses at your next party! Fill 'em with a few ice cubes and a frosty beverage, then sit back and listen to the conversation change! When it does, make sure you don't forget to toast all of those people & local businesses that help Portland stand out from other cities, making Portland a fantastic place to live! Here's to another PINT! Only $5.00 each! http://www.keepportlandweird.com/file/2013/06/kpw-wall.jpg 236 300 Keep Portland Weird http://www.keepportlandweird.com/file/2017/06/logo.png Keep Portland Weird2013-06-26 21:37:562013-06-26 21:41:24Is Portland still weird or is it refined?